www.mandingoscrolls.blogspot.com Sierra Leonean Writers Series, 2016. pp. 212. ISBN-9991054448. PageMaster Publishing, 2015. pp. 210. ISBN-10: 1988048001; ISBN-13: 978-1988048000. ‘A Suitcase Full of Dried Fish and other stories’ exposes the intricacies of human relationships. It reflects the pleasure and frustrations of post-independence Africa and the Caribbean. The stories lead us to accept the encouraging fact that even in times of difficulties, a lot more could be done with resilience, and much could also be lost where there is no mercy. The book of twelve short stories, with illustrations, seeks answers to questions pertaining to the consequences of Mankind’s ravenous desire for money, power, and love; the unabashed transgressions of societies ostensibly patronising selfishness, bloodshed and afflictions. Although first published in 2015 by PageMaster Publishing, it is no mean feat that Bakar Mansaray’s book was re-published at the same period as that of ‘Leoneanthology: Contemporary Short Stories & Poems from Sierra Leone,’ edited by famed poet Gbanabom Hallowell. Hallowell’s was a formidable collection of works by well-known and budding writers looking at the world with exceptionally conscientious eyes. Presently, as in the 1990s, the works of ‘Leoneanthology’ emphasise the need for selflessness, peace, and justice, amongst people that suffered a decade-long apocalyptic-type civil war. 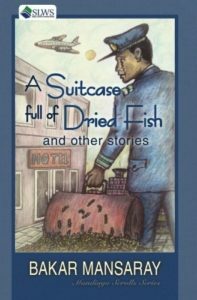 Mansaray’s ‘A Suitcase Full of Dried Fish and other stories’ is seductive, and it is set in different African, European, and North American countries. His style is versatile, thereby providing us penetrating impressions that grant us the opportunity to reflect on life with eyes washed in salve. The first story in the book is about a woman’s addiction to an online dating website for which she was rewarded only by deceitfulness. The second story takes us through the societally stigmatised life of a HIV patient who cannot stop serving men in one of Freetown’s notorious brothels. This story is followed by a satiric one about a flamboyant despot whose rule is challenged by a group of disgruntled university students. Life in Canada as an undocumented immigrant is reflected in chapter four in which a black Caribbean man is accused of killing a white man. The consequences of polygamy, an age-old practice, are featured in the next chapter as a run-away wife finds marital joy and happiness in her spiritual healer. Next a story of the rigours of Koidu town in 1969, a chaotic diamond-mining town prodigal of hustlers, hungry for profit and pleasure, is exposed in downright destitute and equally rich characters. Chapter 7 tells of a once unemployed African university graduate who finds himself disappointed in France with a suitcase full of maggot-infested dried fish. The plot of the next story, ‘The Nairobi School Girl’ takes an extraordinary twist when the teacher who impregnates his pupil goes into hiding with his heart in his mouth, and a blemished reputation. The book’s concluding surrealistic story, ‘Eternal Bliss’, follows the protagonist beyond the grave into the afterlife. However, the suspense in some of the stories is not prolonged enough before the climax, thereby leaving the reader asking for more. With regards to short stories, ‘A Suitcase Full of Dried Fish and other stories’ doesn’t seem to have some of the unforgivable characters of Chimamanda Adichie’s ‘The Thing Around Your Neck,’ or that of Bessie Head’s ‘The Collector of Treasures and Other Botswana Village Tales’ for which she received the South African Order of Ikhamanga, but there is this indescribable euphoria that leaves one with the impression of an author who has lived life rather heartily.